Do you ever stare up at the night sky, at the stars or just at the dark vast expanse of it all, and find yourself wondering whether or not we’re alone in the universe, or if there’s anyone staring back? Me neither. But Paul Davies does; he’s the current chair of SETI (the Search for Extra-Terrestrial Intelligence) – the slightly more frivolous but nonetheless rigorously scientific offshoot of the astrophysics sequoia that is NASA. In 2010 SETI reached the grand old age of 50, and Paul Davies thought that this would be a good point to take stock of the group’s modus operandi and even to suggest radical new approaches and methodologies which, Davies insists, must be implemented if SETI is to be taken seriously and prevail into the new century. After all, fifty years and millions of dollars later, SETI has yet to discover anything of significance whatsoever. But Davies isn’t disheartened: SETI may be 50 years old, but if The Eerie Silence is anything to go by, there’s life in (and hopefully out) there yet! As well as being a history of SETI, The Eerie Silence is also a passionate defence of the organisation. To me, Paul Davies’ prose carries with it an almost plea-bargaining air of hopeful self-preservation. SETI has come under a lot of fire recently; especially sceptical commentators like to label the project as being an embarrassing white elephant of the science world – after so much money and no results, what’s the point? There’s also the cynical and somewhat prevailing sentiment that searching for alien life is nothing more than pseudoscience; the stuff of immature sci-fi novels. However, by far the most damaging (and popular) criticism of SETI is a kind of economic determinism, which argues that if SETI is someday successful in detecting a non-terrestrial, artificial radio transmission, there will likely be no practical, financial or economic gains from doing so. High monetary input with no monetary yield does not make for valuable investment. Concordantly, SETI has suffered from substantial funding cuts in recent years. Of course, being the liberal student of the arts that I am, I take issue with the notion that all human endeavour should be geared towards a financial end-product. Whatever happened to finding value in the journey? Or striving to achieve something not because it carries a large financial incentive, but because it’s incredibly difficult and challenging? The frontier spirit, Davies argues, is intrinsic to human experience, and it’s a shame that SETI, as endeavour, is no longer considered viable purely because it carries no fiscal (or in some cases military) guarantees. If the current funding trend continues, then SETI will soon be entirely dependent on benevolent private donations: hardly the stable bedrock required by long-term scientific enquiry. Drawing the reader’s attention to the many criticisms of SETI is risky business, but Paul Davies provides convincing and intelligent rebuttals to all of these. His determination to present SETI as a serious methodical pursuit rather than the imprecise hobby child of UFO obsessed sci-fi dorks is commendable, if a tad unnecessary. Yet the article of contention with which the book is most concerned is scientific, namely: the Fermi Paradox. The paradox’s namesake Enrico Fermi became famous for espousing a form of evidential scepticism about SETI: “where are they?” is how he succinctly voiced his concerns. Basically, the Fermi Paradox can be summed up thus: if the universe is so old, and so big and so full of so many trillions of stars, then why is there absolutely no evidence of alien life anywhere? (okay, so it’s not technically a “paradox” – but hey, they’re only scientists!). It sounds simple enough, but the Fermi Paradox has so far proven to be the foremost prodigal spanner in SETI’s otherwise well-oiled works. If the universe is metaphorically teeming, then why does it seem so…empty? There are two possible explanations: either there’s something fundamentally wrong with SETI’s search methodologies, or we really are alone after all. Paul Davies plumbs for the former. The Eerie Silence argues that it’s time to stop pinning our hopes on targeted alien radio broadcasts and to begin looking for any signifiers of intelligence and life; no matter how alien they may seem to us. He begins at home, with the concept of a ‘shadow biosphere’. Put simply, this is the theory that instead of spawning just once on Earth, life may have begun twice, or three times etc… If provable evidence of a ‘second genesis’ could be found (for example, microbes with left-bonding amino acid systems, as opposed to the right-hand amino bonding of all known life) then the probability that life exists elsewhere in the universe would be elevated to a near factor of 1 (100%). If life spawned twice on one planet, then the chances of it happening anywhere else would be much, much higher. Serious experiments to find terrestrial life from a ‘second genesis’ are currently in the planning stages in America. Aliens among us indeed. Next Davies examines the theory of panspermia, which puts forward the mind-boggling notion that life on Earth was ‘seeded’ from elsewhere in the universe, such as by hyperextremophile microbes hitching a ride in meteorites. Maybe life was bio-engineered by intelligent, unknowable aliens. Self-replicating probes that plant life on habitable ‘target’ planets are also considered by Davies. I think it very likely that biological intelligence is only a transitory phenomenon. If we ever encounter extraterrestrial intelligence, I believe it is overwhelmingly likely to be post-biological in nature. Davies even suggests that the best way to find E.T might be to look for evidence of galactic mega-structures, such as Dyson spheres (massive grids of satellites constructed around entire stars to absorb energy) and Matrioshka brains (super-computers so big that they are built as shells around black-holes, and harness energy from within). These super-structures would emit unmistakable infra-red signatures, and so would be easy to detect. Stylistically, Davies is a man after my own heart; he employs frequent parenthetic digressions (that is, stuff in brackets) to express several ideas at once, as well as to make sometimes pithy and wry comments on whatever topic is at hand. Structurally, however, the book has some problems. Barely a page goes by without Davies using the phrase “more about this later”. While sometimes tantalising, more-often-than-not I found this sort of referential aside to be irritating, drawing attention to the fact that the book’s chapter structure probably isn’t optimal. The Eerie Silence isn’t unadulterated popular science either. For the polymaths among you, it’s also possible to read it as a strikingly philosophical work. Davies takes time to explore such frightening eschatological theories as the so-called ‘heat death’ of the universe; an end-game scenario in which all entropy reactions have expired, leaving no thermodynamic energy to sustain life, matter, motion, anything. The concept that the universe is on a slow, unstoppable march towards nothingness reads like an astrophysics expression of Nietzschean nihilism. But while I (obviously) can’t fault his science – (I have to take it on faith), Paul Davies’ understanding of history leaves something to be desired. Davies argues that modern science only came around because Judeo-Christian society has a kind of oneness about it which is perfect for spawning scientific method. I respectfully disagree. Correct me if I’m wrong, but my impression was that the rise of mass-organised religion in Europe culminated in the so-called medieval ‘dark ages’ – a period of retarded scientific progression that was finally transcended by the Renaissance, when radical thinkers began to rediscover pre-Christian modes of enquiry (hence ‘neo-classicism’). It wasn’t Judeo-Christian ideologies that lead to the development of modern science, but ancient Greek philosophy, which insisted that the universe isn’t random and absurd, but logical, knowable and ordered. That’s my two cents anyway; but what do I know? This is a minor niggle however; on the whole The Eerie Silence is complexly wonderful, eminently readable and (insert adverb of your own choosing here) accessible (hell, if a certified science reprobate like me can understand it, anyone can). There’re a few frivolous passages that engage with aliens in pop-culture (such as basic (though admittedly comic) reviews of Contact and Independence Day), which do nothing to squash SETI’s image as an organisation populated by sci-fi loving geeks (the dust jacket’s author photograph doesn’t help matters either – a black and white snap of Davies in all his bi-focal, thick-rimmed, bowler haircut glory). But the best way I can describe The Eerie Silence is to tell you that it’s relentlessly, unremittingly interesting. And unlike most popular science, this is a humanising and encouraging work. A more cynical reading than mine might label The Eerie Silence as a book that romanticises science. But SETI is an on-going endeavour, and it’s admirable (and refreshing) that Davies stresses the value of exploration, curiosity and human progress outside of any financial context. There is science here, there is maths here; but it’s also a book with an identifiable, emotional heart. Finally, Davies takes great pains to stress that SETI may never succeed; there are so many variables and so much is unknown that some critics don’t even think of it as true science. But Davies insists that SETI press on – “The probability of success is difficult to estimate; but if we never search, the probability of success is zero”. It turns out that the real sine qua non of SETI isn’t money, but hope. 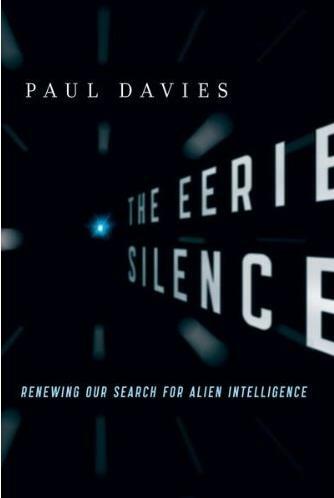 This entry was posted in Reviews and tagged Paul Davies, SETI, The Eerie Silence. Bookmark the permalink. Faulks on Fiction – An on-the-fly Review. I’m reminded of J. Diamond’s remark about the foolishness of SETI programs. If geneocide occurs so readily between human beings when two cultures make first contact, imagine the horror of making first contact with an alien race. I suspect it wouldn’t be pretty. It’s an interesting point; one which Davies addresses towards the end of ‘The Eerie Silence”. Davies is head of the ‘post-contact task force’ a kind of speculative think-tank with no official power, but a great deal of respect, which formulates possible responses to contact scenarios. Davies’ angle is basically this: any society that is SO advanced that they can travel across the galaxy to meet us probably won’t be hostile; afterall, if they’re -that- advanced, they won’t be covetous of our technologies or resources or bodies. The human-as-slave theory is a kind of throw-back to B-movie Sci-fi, and shouldn’t be taken seriously, Davies argues. Besides, I think SETI is much more about detection than contact; SETI searches for in-coming radiowaves, it doesn’t send any outgoings. yet. The implicit assumption here, with which I definitely don’t agree, is that superior technological advancement is coupled with superior moral advancement. As for reading your blog, my pleasure! The distances involved make any scenario in which contact leads to our being attacked a bit absurd really. It would take them millennia to reach us. Probably vastly longer. He’s an interesting writer Davies. He’s won awards for his work on science and religion. I would expect him to be on absolute top form on this sort of thing and it sounds like he is. I do think that searching for galactic mega-structures is a more fruitful route to follow. A lot of SETI is predicated on the idea that civilisations broadcast vast amounts of radio – an idea born of the fact that’s what we were doing. We’ve already cut down heavily though with the growth of broadband cable and it now looks like our period of megabroadcasting may be quite short even though we’re still here. If so, searching for others doing the same seems pointless. If we wouldn’t find us why should we find others? I agree that the megastructure thing is certainly intruiging: but Davies, as always, presents both sides of this argument by quoting (I can’t remember who): “Any society capable of building a Dyson Sphere, doesn’t need one.” So maybe they’re not out there. This is the first book by Paul Davies that I’ve read: I enjoyed it muchly: the prose is so conversational; almost chatty. First, if the EM phase is indeed short, and given that the universe is at least 15 billion years old, what is the probability that a significant number of civilizations are in the listening window for us? If a system that is 500k light years away from us goes through the EM phase 1 million years ago, then we would never hear them, like ripples on a pond, once they pass, they are gone. I suppose there could be reflections. At any case, given that our own EM phase will be short, it seems the critical timing of the listening window for us would be a large reason for the silence.